Who needs a social networking tool, when you can bond over giant robots, fancy guns, and saving the world from ultimate destruction? Take that Facebook! You don’t stand a chance, Myspace. Theorian, a company that strives to create outstanding software and technological solutions for these advanced times, has released an amazingly detailed, high-speed 2D-shooter game. You’ll enjoy the kind of gameplay you find in first-person shooter games, but in a third-person format. In the game, you’ll take on the role of different NanoMechs, bio-mechanical militaristic mobile robots created by humans, and protect nanoscopic human colonies from destruction. So what’s the crazy backstory on that? Well, humans created the nanoscopic world after their failed attempts to escape from a resource-depleted Earth to explore other suitable, life-sustaining planets. They didn’t get very far because of wormhole problems, so they found an alternative solution and shrank themselves. In that process, they became “purified” after removing unnecessary molecules from their bodies. Now nanoscopic, they are able to survive on the resource-poor Earth (which supports over 100 billion teeny tiny individuals). The game takes advantage of the accelerometer: you can tilt your iPhone to make the robot walk backward (tilt left) or forward (tilt right). Tap anywhere on the screen to aim the gun and shoot. There are also buttons you tap which allow you to jump and use the booster (picture mini rocket jets on the bottom of your feet). Meters on the left-side of the screen also provides information on remaining energy, shield, and ammo levels. You can also switch weapons by tapping the upper right-hand corner of the screen and select from 4 weapons to blow up enemies (or online friends). At the start screen, you can also select “Settings” and pick your favorite robot from a selection of four to play the 4 different levels in either death match or time-attack game modes. Nanomechs has fantastic gameplay. 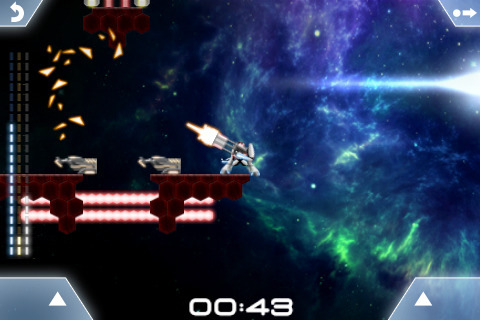 The game boasts 30-40 frames per second so the graphics offer much more details than one expects for a shooter game on the iPhone. Also, the music and sound effects are a nice touch. I appreciated the ability to lower the robotic sound effects. The game becomes very addictive for those who enjoy shooter games. You’ll also have the opportunity to play with multiple players if a wi-fi network is available (select “Multiplayer” option at start page and choose from play online, start battle, or play nearby). The introductory game is being offered at a low price, so the higher price may not be worth it for newer updates. Time will tell. Developers also promise additional weapons, levels, game modes, customizable NanoMech robots, and yet-to-be-named features. To make that higher pricetag worthwhile, developers should also consider adding larger weapons, different obstacles, and a more comprehensive tutorial on how to play. Simply offering instructions for a shooter game is not enough, especially for newbies. Beginner shooter players may become frustrated trying to learn the controls and figuring out what items to get and which enemies to avoid. Help the guy and gal novices out, Theorian. If you like fast-action shooter games with multiplayer features, you’ll enjoy NanoMechs. It’s a fantastic release that offers a complete gameplay experience. Grab it now before they increase the price. If you buy the limited release, you can enjoy all the current and future feature updates at the low price of $1.99 while your slow friends will pay more. AppSafari review of NanoMechs was written by Linda Ta on March 17th, 2010 and categorized under Action, App Store, First Person Shooter, Fun, Games, Multiplayer. Page viewed 5478 times, 1 so far today. Need help on using these apps? Please read the Help Page. Its 2D and the graphics are still awesome. I can see how it could be made better with a few sprinkles of 3D. However, I tell you, when you play online with other players, you just can’t explain it. There is an excitement and joy that I have never, ever felt with the disconnectedness of gaming on a mobile device. Now I finally get to the emotional high that get when playing console and PC games! I heartily recommend this title. You just don’t realize it until you try it!! I wish I could hug the person who wrote this review! I mean who ever it was really did the research and it’s not just because they mostly enjoyed the game. I just liked how they wrote it! Thank you! NanoMechs with new levels and new Control Pads has been released!